Former Superman actor Christopher Reeve has said his optimism has been lifted after meeting a formerly paralysed man in Israel who can walk again. The actor, who is largely paralysed from the neck down after a riding accident in 1995, is in the country this week to study spinal injury research and meet injured Israelis, including victims of suicide bombs. "It's the most extraordinary case of recovery I've ever seen in a human being," Reeve said of the young man, who was able to walk again after pioneering surgery at Israel's Weizmann Institute of Science. "It has renewed my hope and optimism," he said. Reeve also visited Jersualem's Alyn hospital, where he met 24-year-old woman Rahab Badar, who can now walk when aided after years of therapy following a car accident seven years ago. "It's a miracle I can walk. Hopefully one day Superman, with God's help, will be able to walk as well," she said. Israel is one of the world's leading nations for spinal injury treatment and stem-cell research. Reeve met Israeli met Foreign Minister Silvan Shalom earlier this week. Mr Shalom described Reeve as a "hero". "I would like to thank you really that you have the time to meet with those courageous patients, that among them we have survivors of terrorist attacks," he said. Reeve, 50, defied expectations earlier this year when he recovered some feeling in his body. 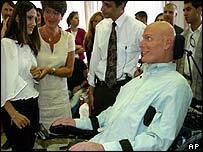 He is now chairman of the Christopher Reeve Paralysis Foundation and travels widely to give motivational talks.